Lily’s Sweets, an innovative new chocolatier, has announced the arrival of the first Fair Trade Certified, stevia-sweetened chocolate bars made with 55 percent cocoa. Made from the finest all-natural ingredients, Lily’s bars are naturally 25 percent lower in calories than other 55 percent dark chocolates sweetened with sugar. Four flavors, Original, Crispy Rice, Coconut and Almond, are debuting in Whole Foods Market stores in March. "Lily’s bars are naturally 25 percent lower in calories than other 55 percent dark chocolates sweetened with sugar," said Chuck Genuardi, CEO and founder of Lily's. Chocolate lovers everywhere have a new reason to celebrate their favorite indulgence. Lily's Sweets, an innovative new chocolatier, has announced the arrival of the first Fair Trade Certified, stevia-sweetened chocolate bars made with 55 percent cocoa. Made from the finest all-natural ingredients, Lily’s bars are naturally 25 percent lower in calories than other 55 percent dark chocolates sweetened with sugar. Four flavors, Original, Crispy Rice, Coconut and Almond, are debuting in Whole Foods Market stores in March. Offering 100 percent indulgence, Lily’s 3-ounce (85 gram) chocolate bars contain no added sugar, no artificial ingredients and no GMOs. 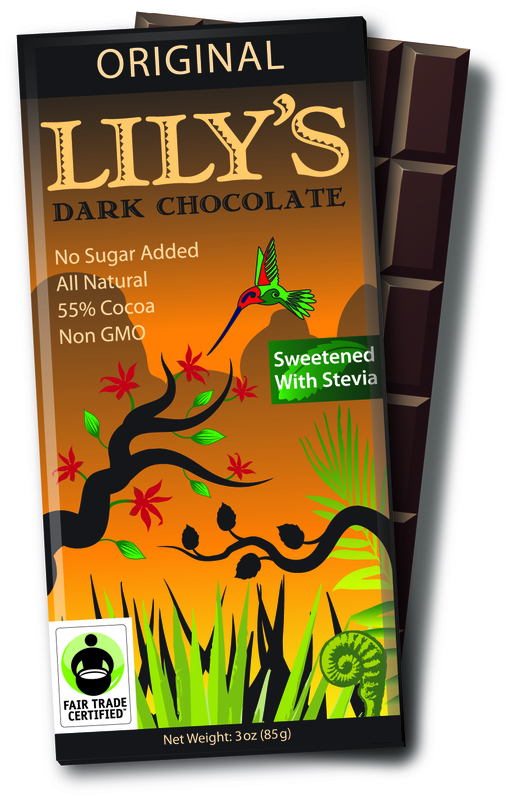 Lily’s premium dark chocolate is sweetened with stevia, a natural sweetener that comes from the plant Stevia rebaudiana. Also known as sweetleaf, stevia is 200-300 times sweeter than table sugar with none of the unhealthy characteristics. It does not raise blood sugar, it has virtually no calories, and it has been used to sweeten food and beverages around the world for centuries. Unlike other stevia-sweetened products, which can be overly sweet or bitter, Lily’s proprietary blend of stevia, erythritol, inulin and dextrin - all naturally occurring plant-based sweeteners and fibers - gives the chocolate a uniquely smooth and balanced flavor. With just 160-170 calories per half-bar serving, Lily’s premium dark chocolate is an ideal treat for all chocolate lovers, including those watching their weight, as well as for diabetics looking for indulgence without raising their blood sugar. 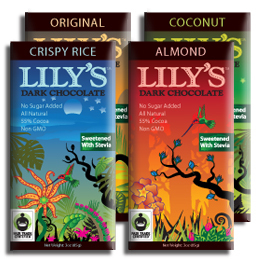 In addition to Lily’s Original flavor, Lily’s signature 55 percent dark chocolate is blended with organic coconut, organic crispy brown rice and dry roasted almonds to create Lily’s Coconut, Crispy Rice and Almond chocolate bars. Lily’s Sweets chocolate bars feature a gold ribbon as a symbol of support in the fight against childhood cancer. “Lily’s Sweets’ namesake is my niece, Lily, who in the midst of fighting childhood brain cancer, raised money to support services for children less fortunate than she,” explains CEO and founder Chuck Genuardi. In honor of Lily’s bravery, the company donates a percentage of its profits to organizations that support childhood cancer survivors and fighters, such as Camp Cranium (http://www.campcranium.org). “We hope to ease these children’s burdens and bring them a bit of joy,” says Genuardi. Lily’s inspiring story can be found at http://www.lilyssweets.com. Lily’s Fair Trade Certified chocolate bars are available exclusively in Whole Foods Market stores at a suggested retail price of $3.99 per bar. Look for Lily’s at other fine retailers beginning in May.